Hand-held loader fills pistol magazines quickly and easily, so you spend less range time loading mags and more of it shooting. Smooth, positive operation protects fingers and thumbs while you load hundreds of rounds painlessly—as fast as one round per second. Also lengthens magazine life by reducing wear and tear on feed lips. Hold the magazine upright with the bottom resting on a solid surface. Place the loader over the top of the mag, press down lightly while squeezing the lever to depress the follower, drop in a round, and work the lever quickly to push it into the mag. Repeat the process until the magazine is full. Constructed from tough, reinforced, black polymer. Locks closed when not in use, so it takes up minimal space in pocket or range bag. UpLula fits single- and double-stack 9mm, .357 SIG, .40 S&W, 10mm, and .45 ACP magazines, plus some .380 mags. Will not load Glock 6-round single-stack .45 caliber, Smith & Wesson 7-round single-stack 9mm, or magazines with less than 8mm between feed lips. Will also need to purchase the UpLula Align Insert. I bought one primarily for my 10-rd 9mm mags. Works great. This morning I tried it on my CMC 10-rd .45 cal magazines. Awesome! I Just ordered another. (Got the pink to find it easily in my range bag.) Great product. There is no other product that even comes close! Everyone who owns a magazine fed firearm needs a MAGLULA of some sort. My first two MAGLULA magazine loaders were black except for my wife's which is pink. Thereafter I bought the bright yellow or pink versions as they are not as easily lost. I really wish MAGLULA would make one in a high viability hunter's orange. Also, if you have a black unit, think about affixing a bright orange, long shoe lace to it. I bought one of these to keep in my range bag and was so impressed with it, I bought a second one! These things work great and make loading single stack, double stack, hi cap mags a breeze! I can load my Springfield XDM 40 caliber 16 round mags much faster and easier than trying to do it by hand! WOW! What a difference loading a 17+ magazine by hand vrs using one of these. My Taurus 24/7 OSS DS9 did not offer any loader as an option from the factory but what an improvement the MAGLULA loader makes. It does everything as described and certainly worth the bucks spent. Without a doubt the best loader on the market. Excellent for mags like Glock 22 and all high caps. Highly reccomended. Everyone who sees it wants one. This magazine loader is the best I've seen. Simple to use. No parts to switch when going from single-stack to double-stack magazines. I would recommend this to anyone who shoots pistols - a time and thumb saver! I got one of these at a gun show. What a great piece of equipment. I use it to load my 9mm mags for my hi-point pistol and Berretta CX4 Storm carbine. I also use it to load my Glock 357sig mags. I don't even own one (yet), but used one extensively at a charity shoot for Toys-for-Tots recently. After reading other reviews and articles, I expected it to be good. But not as good as it really is. After a few magazines of getting used to the method, I could easily load 6 rounds in a magazine (competition rules) in about 5 seconds. So I can't vouch for the effort required when you get near a full 15+ capacity magazine, but the loading technique is effortless and non-fatiguing, after about 60 magazines loaded. Bought one a few weeks ago. Was a little slow going at first, but this thing had a very shallow learning curve. I was up to about 1 rnd per second by the 4th mag I loaded. I shoot PPC competition, and will typically load 50-55 magazines per competition. This should save me from last years "painful thumb syndrome" No complaints so far. I gave this product 4 stars because of the price. It seems a little steep for what it is, but only time will tell if it was worth the price. loads my mags faster than i can hand load and no sore fingers,works well for 9mm,40S&W,and 45ACP.Good Product. Excels in versatility as it can load 9mm, 40 S&W, 10mm, 45 ACP, single stack and staggered magazines and everything in between without need for any adjustments or extra parts. Every pistol owner that uses mine wants one! I have friends that have thrown away their Springfield and Glock factory loaders when they get one of these! Requires two hands to use, but it is rugged and is ergonomically designed (and is ambidextrous too). With about 10 minutes of practice you can load as fast as you can shoot accurately! This is a must have for every large bore pistol shooter. 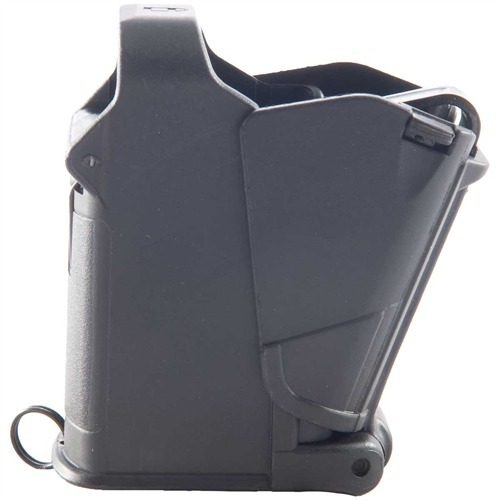 Primarily, if you are a Glock owner, you will love this magazine loader. Those last one or two rounds are difficult to get into the magazine. If you always store them loaded, it is just a hard task. This makes it much easier in either case. I got Glock 27 extended magazines (11 rounds) and couldn't get that 11th round loaded. This loader made the difference. I purchased this product specifically for a STI 2011 45acp. After a couple of uses I started having failure to feed jams. Round up from the mag, bullet nose on the feed ramp, slide stopped. I purchased new mags thinking it was an older mag (3yr)problem. Same jams. I returned the mags to STI for correction and they worked a couple of times. Finally on close observation and measument I found the magazine web forward of the feed lips were squeazed together by the "V" shaped aligner in the uplula. This grabbed the case as it exited the feed lips. I contacted MAGLULA about this and was informed they had never heard of this problem. I have used this product on 9mm mags that were more rigid with no problems. I can not recommend this product for use on STI 2011 45acp Magazines. This invention makes loading even the double stack Glock .45ACP cartridges a pleasure. It takes a little practice and it pays to watch the Brownells video. Once you get it, you wonder how you did without it. It is helpful with 1911's, but absolutely essential for the Glock 10 round .45 ACP. Finally a product that just plain WORKS! I haven't found anything it won't load. So far I've loaded 9mm/40S&W/10mm/45ACP single stacks, 9mm/40S&W/10mm/45ACP double stacks, and even my 30rnd Spectre 4/2/1 mags! Any pistol mag with a single feed position 9mm and larger, it doesn't matter, it just loads them. Load the first mag and you're impressed. Load the second of a different caliber, different type, different capacity and you're hooked. Just imagine how much you'd spend on other mag loaders for everything you and your shooting buddies own. I got mine on sale but even at full price this is the bargain of the century. And best of all: NO MORE SORE FINGERS!!! No more sore fingers. Will load new, stiff mags no problem. Don't know how I got along without it. Loads Glock and 1911 magazines equally well. It loads everything from 9mm through 45. It even loaded a single stack 380 with no problems. I am going to purchase the Baby Uplula for the 380 just because. That way I will have one for the large calibers and the smaller calibers. Absolutely the finest magazine speed loader in existence. After getting a little practice by loading a dozen magazines or so it is also the fastest speed loader I have ever used. It's solidly built and I expect that it will outlast most of the magazines I load with it. Another reviewer posted that he gave it four stars only because of the price. I would give it an extra star on price. If you are shooting a variety of handguns and calibers, it's actually pretty reasonably priced when you match it against the cost of three or four or five other loaders for different size magazines, and especially reasonable when you factor in the fact that it works better than any of those other loaders. A first class product. Well designed and built. Easy and fast to load .45 and.40 cal. My friends all want one. "Where have you been all my life, honey?" I took this loader to Gunsite's 250 class a few years back and after a few days of loading--and then draining--glock mags, I felt like proposing to this little gadget. First, it uses gross, rather than fine, motor skills: you grab it in your fist and use the power of the whole hand and arm to load mags rather than your poor thumb. How easy is this: The rounds you load are simply placed in the loader, its ramps and springs do the rest. The result is that its as easy to load the rounds as it is to shoot them. Second, this efficiency puts you back on the range quicker than the guys that are loading with their thumbs. The downside is that this tool should be used with some discretion as I found that the top front of the glock mags--which are unsupported by metal and thin plastic, can be deformed by the loader's tongue if excessive pressure is used. Not by much but its an operator problem, not the loader. Cut your loading time down to almost nothing, and have more fun shooting! Simply an awesome product. I load several magazines constantly during the USPSA season and this works fast and works great. The best part is, it doesn't hurt my fingers/thumb anymore, which was effecting my grip after a while. My wife and I shoot competative handgun, and both really like this loader. It makes loading multiple magazines fast and easy. We use it with S&W, Glock, Sig, STI, Ruger and Springfield XD double stack magazines. I recommend MAGLULA products to everyone with a magazine fed firearm! "Perfect" is the word. I loaded 12 of my Mcormick 10 round 45 mags in one fourth the time it usually takes. I loaded 9mm ruger LC9 mags in seconds. Anyone who owns Glock 40 cal. 15 round mags knows that the 14th round is difficult and the 15th is almost impossible. It's a real thumb killer. I loaded 18 of these mags in less than 5 minutes with relative ease (the last 2 rounds in each mag requires pushing the tool down against the table a little harder). No sore thumbs, dropped cartridges or grumbling. It makes loading mags almost fun. It operates flawlessly and is an incredible value. I will buy another just for a spare when it is on sale again. It just works! Glock and S&W M&P magazines,10 rounders to 17 rounders are no problem. Piece of cake to learn to use. Wife uses it and loves it. I am going to have to buy a second one for a his and hers pair. Used it for loading the 14 rounds clips on my Browning 9mm High standard.Its a dream come true.The speed and ease is unbelievable. I just recently bought a FN FNX 45 and found the 15 round magazines almost impossible to load to full capacity by hand. So I ordered a UpLula and loading these magazine is now a snap! This is a must have product! excellent design sturdy I have glock 21. with the loader takes about 15 seconds to load 10 rounds.I am buying another for a spare. well worth the money. I have been using this ammo loader for a couple of years now. Makes loading many magazines when at my LGS range a snap. I would hate to be without it! Very durable as I have filled hundreds, if not a couple thousand magazines with my UpLula and still works like it did when it was brand new. If you shoot 9mm, 10mm, 40 S&W, 357 or 45 ACP, you need to have this bad boy for speed and saving your thumbs. I have four just to have one handy wherever I might need one. My wife was having a very hard time loading her Pavona's magazine, but this has made it easy for her. A gadget that really works and should be in any shooter's bag that fights with loading high cap mags. I own almost every Lula loader they make or have one on my wish list! Simple to operate, and really makes the loading of single stack mags easy. I have a double stack Beretta magazine to load and it's very tough to do - even with the thumb loader that was supplied with the mags. After about 1 minute of getting used to this loader, loading these mags are a breeze! No more sore fingers! Absolutely recommend!! Definitely worth the price! Made of good heavy plastic so it should last a while. 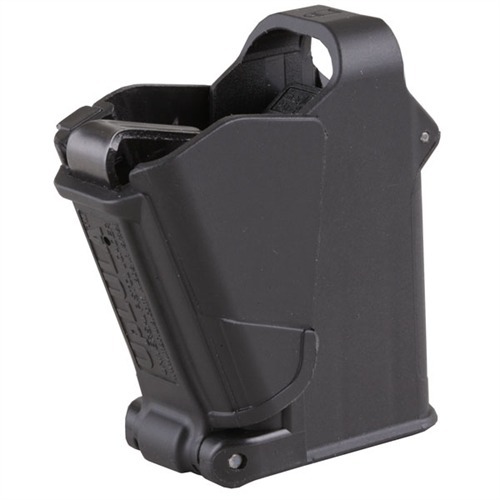 Mfr Part: UP60P 811619021009 Hand-held loader fills pistol magazines quickly and easily, so you spend less range time loading mags and more of it shooting. Smooth, positive operation protects fingers and thumbs while you load hundreds of rounds painlessly—as fast as one round per second. Also lengthens magazine life by reducing wear and tear on feed lips. Hold the magazine upright with the bottom resting on a solid surface. Place the loader over the top of the mag, press down lightly while squeezing the lever to depress the follower, drop in a round, and work the lever quickly to push it into the mag. Repeat the process until the magazine is full. Constructed from tough, reinforced, black polymer. Locks closed when not in use, so it takes up minimal space in pocket or range bag. UpLula fits single- and double-stack 9mm, .357 SIG, .40 S&W, 10mm, and .45 ACP magazines, plus some .380 mags. Will not load Glock 6-round single-stack .45 caliber, Smith & Wesson 7-round single-stack 9mm, or magazines with less than 8mm between feed lips. Will also need to purchase the UpLula Align Insert. 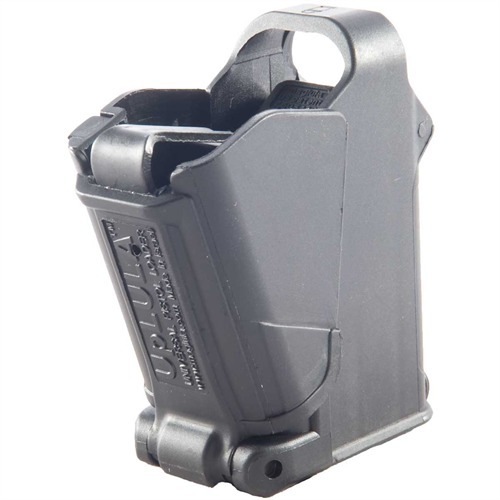 Mfr Part: UP60DG 811619021023 Hand-held loader fills pistol magazines quickly and easily, so you spend less range time loading mags and more of it shooting. Smooth, positive operation protects fingers and thumbs while you load hundreds of rounds painlessly—as fast as one round per second. Also lengthens magazine life by reducing wear and tear on feed lips. Hold the magazine upright with the bottom resting on a solid surface. Place the loader over the top of the mag, press down lightly while squeezing the lever to depress the follower, drop in a round, and work the lever quickly to push it into the mag. Repeat the process until the magazine is full. Constructed from tough, reinforced, black polymer. Locks closed when not in use, so it takes up minimal space in pocket or range bag. UpLula fits single- and double-stack 9mm, .357 SIG, .40 S&W, 10mm, and .45 ACP magazines, plus some .380 mags. Will not load Glock 6-round single-stack .45 caliber, Smith & Wesson 7-round single-stack 9mm, or magazines with less than 8mm between feed lips. Will also need to purchase the UpLula Align Insert. Mfr Part: UP60L 811619021047 Hand-held loader fills pistol magazines quickly and easily, so you spend less range time loading mags and more of it shooting. Smooth, positive operation protects fingers and thumbs while you load hundreds of rounds painlessly—as fast as one round per second. Also lengthens magazine life by reducing wear and tear on feed lips. Hold the magazine upright with the bottom resting on a solid surface. Place the loader over the top of the mag, press down lightly while squeezing the lever to depress the follower, drop in a round, and work the lever quickly to push it into the mag. Repeat the process until the magazine is full. Constructed from tough, reinforced, black polymer. Locks closed when not in use, so it takes up minimal space in pocket or range bag. UpLula fits single- and double-stack 9mm, .357 SIG, .40 S&W, 10mm, and .45 ACP magazines, plus some .380 mags. Will not load Glock 6-round single-stack .45 caliber, Smith & Wesson 7-round single-stack 9mm, or magazines with less than 8mm between feed lips. Will also need to purchase the UpLula Align Insert. Mfr Part: UP60PR 811619021054 Hand-held loader fills pistol magazines quickly and easily, so you spend less range time loading mags and more of it shooting. Smooth, positive operation protects fingers and thumbs while you load hundreds of rounds painlessly—as fast as one round per second. Also lengthens magazine life by reducing wear and tear on feed lips. Hold the magazine upright with the bottom resting on a solid surface. Place the loader over the top of the mag, press down lightly while squeezing the lever to depress the follower, drop in a round, and work the lever quickly to push it into the mag. Repeat the process until the magazine is full. Constructed from tough, reinforced, black polymer. Locks closed when not in use, so it takes up minimal space in pocket or range bag. UpLula fits single- and double-stack 9mm, .357 SIG, .40 S&W, 10mm, and .45 ACP magazines, plus some .380 mags. Will not load Glock 6-round single-stack .45 caliber, Smith & Wesson 7-round single-stack 9mm, or magazines with less than 8mm between feed lips. Will also need to purchase the UpLula Align Insert. 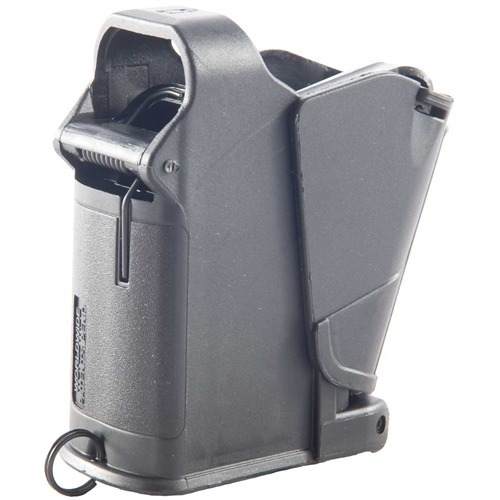 Mfr Part: UP60BO 811619021030 Hand-held loader fills pistol magazines quickly and easily, so you spend less range time loading mags and more of it shooting. Smooth, positive operation protects fingers and thumbs while you load hundreds of rounds painlessly—as fast as one round per second. Also lengthens magazine life by reducing wear and tear on feed lips. Hold the magazine upright with the bottom resting on a solid surface. Place the loader over the top of the mag, press down lightly while squeezing the lever to depress the follower, drop in a round, and work the lever quickly to push it into the mag. Repeat the process until the magazine is full. Constructed from tough, reinforced, black polymer. Locks closed when not in use, so it takes up minimal space in pocket or range bag. UpLula fits single- and double-stack 9mm, .357 SIG, .40 S&W, 10mm, and .45 ACP magazines, plus some .380 mags. Will not load Glock 6-round single-stack .45 caliber, Smith & Wesson 7-round single-stack 9mm, or magazines with less than 8mm between feed lips. Will also need to purchase the UpLula Align Insert. Tactical Instructor Belt Nylon 1.5" Black 36"